You’ve probably figured it out by now, but building muscle isn’t easy, at all. In general, you’re going to have to increase your daily caloric intake, making sure you’re eating enough protein, carbohydrates, and healthy fats to fuel your body, you’re going to have to train hard and smart, and one of the hardest things you’ll have to do is be patient. Sounds doable, right? Instead of overwhelming you with every aspect of muscle building, we’re going to focus specifically on what you need to do to build muscle at the gym. A question I get asked a lot is, “What exercises should I do to build muscle?” My answer: there are hundreds of exercises that will help you build muscle. When training the general population, I like to utilize compound exercises, multijoint movements that work groups of large muscle. I prefer these movements because they require more energy to perform, which means you’re burning more calories and fat. A few of my favorite compound exercises are squats, deadlifts, lunges, rows, and pull-ups. Here’s a list of compound exercises you should begin programming into your workouts. If there’s anything you take away from this post, let it be that compound exercises are great and will help you get the most bang for your buck. That said, you don’t want to be in the gym lifting aimlessly, which is why it’s also important to know how heavy your weights should be along with your rep and set scheme. When you go to select your weight, I recommend choosing a weight that’s 75 to 85 percent of your one-rep max – the heaviest you can lift for one rep of a given exercise. If your goal is to build muscle, generally speaking, your rep and set range should be between three and five sets of 8-20 reps (depending on the complexity of the exercise and the program) per exercise. I also advise taking 30 to 60 seconds of rest between each exercise; once again, this will vary depending on the complexity of the exercises and program. 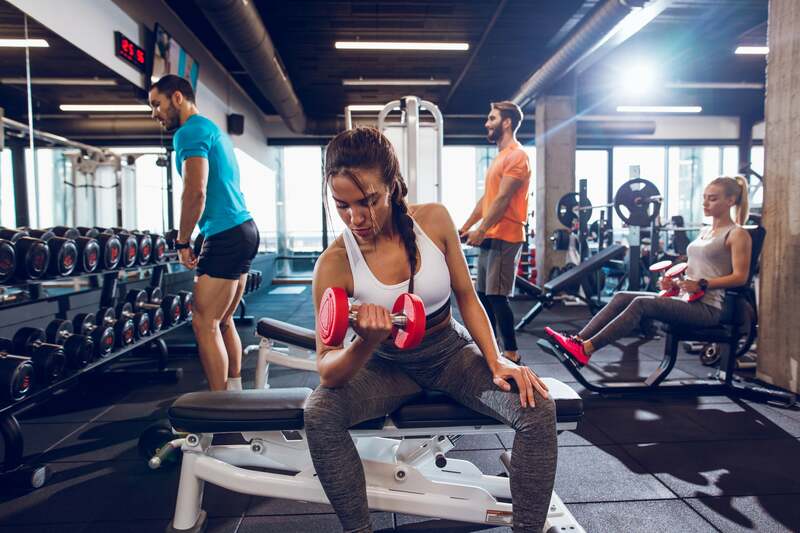 Now that you know the foundation of what constitutes a muscle-building workout, you’re probably wondering how often you should be hitting the gym. Like most things in fitness, there isn’t one perfect answer to this question. I typically recommend starting off with three days of strength training, let’s say Monday, Wednesday, and Friday, two days of cardio or whatever other activity you like, and if you’re really feeling it, a day of yoga (here’s a great flow for weightlifters). This isn’t the only weekly schedule that will work, so you’ll have to play around, and find what works best for you. The best advice I can give is to not take on too much too soon, allow your body to get acclimated to strength training, and follow your program for at least four weeks before you start making any changes. If you’re looking for strength workouts to follow, try this four-week muscle-building workout plan.